The city is about 5.5 hours from my little inn so we are driving. Though, after arriving safely into the city, the car will be parked and quickly forgotten as taxis, subways, and feet will be the preferred mode of transportation. My Dad is taking care of my little inn and my kitties while I’m away. Thank goodness for Dads. 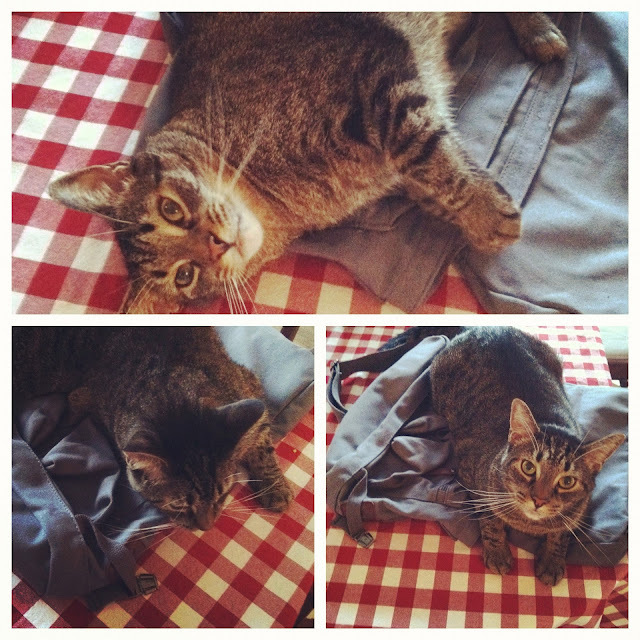 Though, I’m pretty sure Sebastian may have wanted to come along. Either that or he was just obsessed with the my new bag. It’s where he spent most of his Sunday. I have somewhat of a plan for this trip thanks to all your fabulous suggestions. Thank you so much! So far, here’s what I’ve come up with… We will attempt to eat at Sarabeth’s, Sullivan’s Bakery, Lombardi’s – supposedly ‘the best’ pizza, Serendipity – frozen hot chocolate, some place in Soho (either Balthazar’s or Hundred Acres, or Boquera). We will visit the magical land of Soho, we will attend the blogger social (more on that tomorrow), visit Rockefeller center, attend the musical Once, stroll through central park, visit the highline and other things are still TBD. Sounds pretty good, right? I’m thinking I should have a better plan, but I’m also hoping things will somewhat fall into place. I’m a bit nervous about this trip, but I’m also super excited! It’s been so long since I’ve visited the city and took sometime away from work, so I’m really look forward to it. … on Facebook and Instagram. I’m trying to figure out what to wear to this darn blogger social and I can’t make up my mind. Instagram seems to favor the one on the right while Facebook was pretty much a tie. 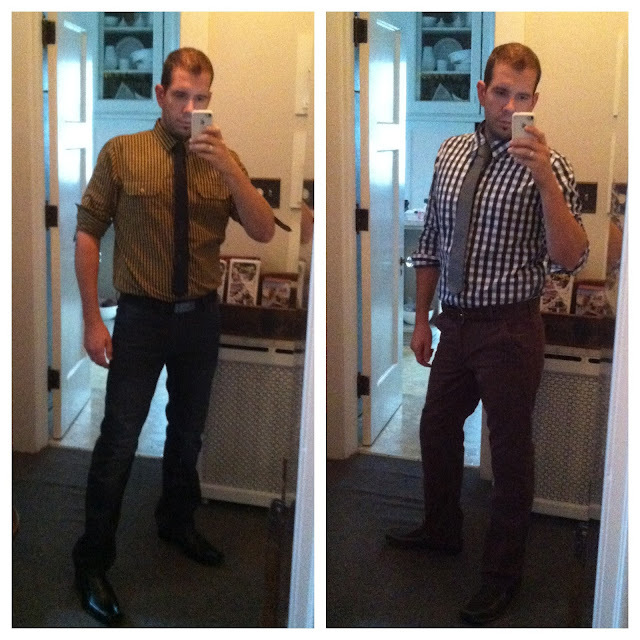 The outfit on the left is black shoes, blackish/dressy jeans, a yellow and black gingham shirt, and a black tie. The outfit on the right is brown shoes, maroon chinos, a navy gingham shirt, and grey tie. I’m still undecided by I’m leaning toward the one on the right. It just seems more ‘me’ and more ‘Inspired by Charm’. Does that make sense? If you have some advice, please PLEASE let me know in the comments. I’m brought both along just in case. And finally, I’ll be sharing my travels as we go. You can follow along on Facebook, Twitter, and/or Instragram. 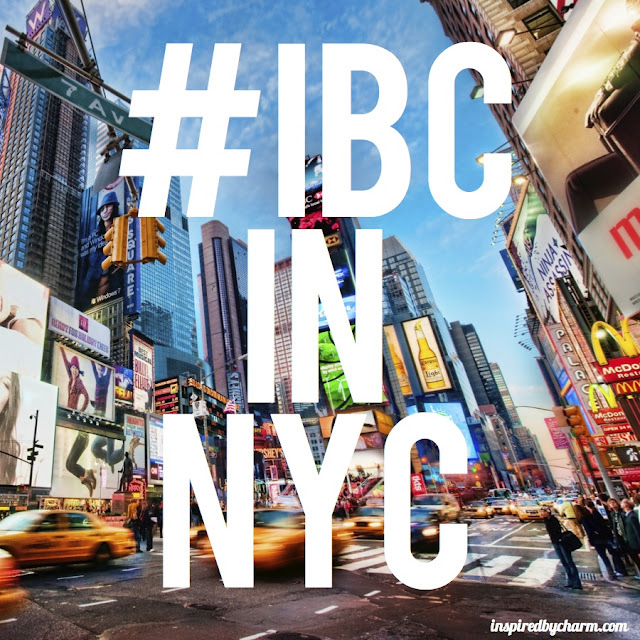 I’ll be using #IBCinNYC to keep everything organized. I’ll also let you know tomorrow how you can follow along during the blogger social as well. Good luck Michael! Welcome to my neck of the woods and I vote for the outfit on the right! Have a great time in NYC you will love it! Have so much fun Michael! I thought you looked so handsome in both photos that I forgot what you were asking us to do, hence my “what was the question again?” comment on FB. I really think you can’t go wrong with either outfit. Have fun. Love the checked shirt. Can’t wait to hear all about your trip. Michael, I just found your great blog and was inspired. I have been perusing you posts and am especially fond of your coffee bar!!! Great idea and great look! I need to keep my eye on what you are doing… I am a new follower! So happy to find you! Both outfits will be fine in NYC. I like the outfit on the left (with the black) more, but you look more comfortable in the outfit on the right (with the maroon) – it’s in your pose, your stance. 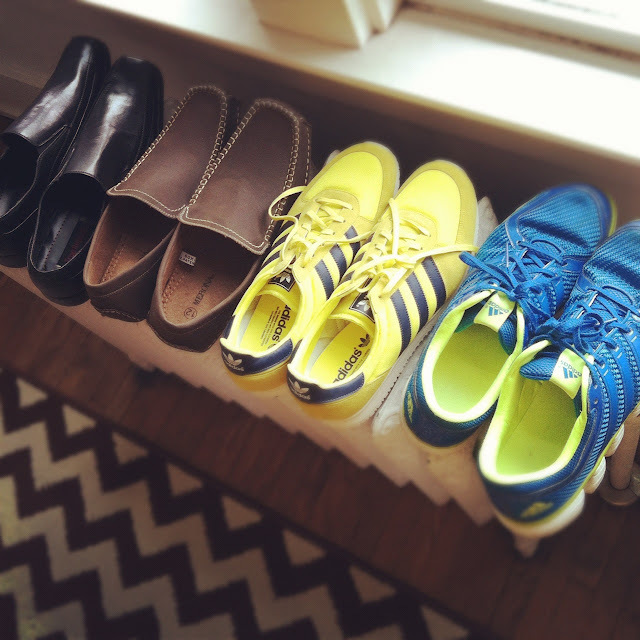 You should wear what makes you happiest! I’d say mix them both together- the black pants/shoes with the grey buffalo check plaid shirt and the black tie. Enjoy your trip! I was back home last August- NYC is always a magical, magical, place! I love your blog, but want to suggest that you consider getting an editor. Your posts are full of typos, misused words, and grammatical/punctuation errors. Probably not the end of the world, but as you consider moving forward into publishing books, style manuals, etc. this will become more and more apparent as a requirement. You have wonderful things to share with the world – make it easier on us to read about your many projects and adventures! I am posting anonymously because, frankly, I don’t want to be spammed by your many fans! I count myself among them. Please try to visit Mario Batali’s Eataly! LOL everyone wants to give you unsolicited advice, poor guy…. While both outfits are handsome, I vote for the one on the right. It seems more relaxed and summery… Have fun in New York. I pick the one on the left. Have fun! Actually, as someone who reads with a critical eye, Anonymous is right. Much as I love your posts and style, you need a grammar and spell check errors. And you do need them both, Michael as spell check will let “they” pass for “the” for example. Content and execution are equally important. I think the photo on the left with the black jeans is “the one.” Have fun in NYC. Michael, along with all of the wonderful things being in the public eye brings, it also brings the critics! I had a friend once that wrote “I try to include something for everyone in my writing so if you have found a spelling or grammatical error, it was put there just for you!” I loved that and it got the point across. Some folks just have to be critical. I love your blog, love your pins and your recipes are to die for! Enjoy NY and I’ll look forward to hearing about your trip as I’ve never been. Sorry, dude, you know I had to go search out the comment critics. The one that cracks me up is Leslie, who while trying to correct you, makes multiple grammatical mistakes herself. How would one need “a grammar and spell check errors?” What is that? Also, you’re not supposed to start a sentence with “And”, Leslie. While I’m at it, you need a comma after Michael. Check yo’ self before you wreck yo’self, Leslie. Aside from the grammatical error Leslie made in her comment to you here, she has at least one typo in her own blogger profile. 😉 I come to your blog for decor and style inspiration – not for an English lesson! Thanks for sharing all your ideas; looking forward finding out about everything you’ve got coming up!